Earlier today we decided to use the remaining coupons that my friends ordered via some discount/coupon site. 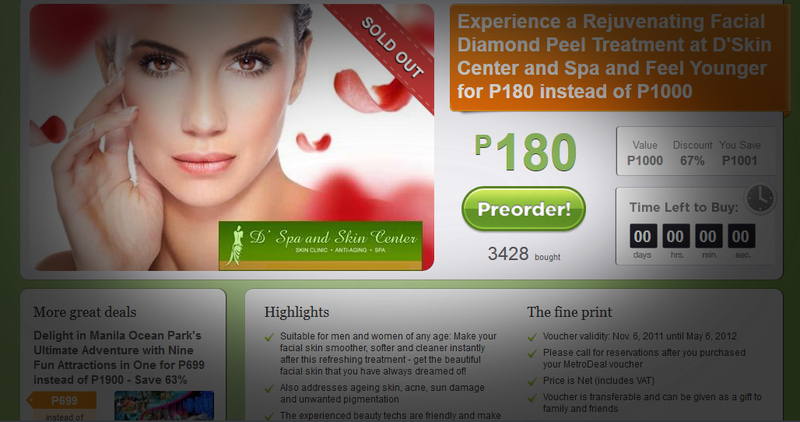 The service was diamond peel valued at P1,500 discounted to P250 from a 'spa'. The voucher's expiration is today. 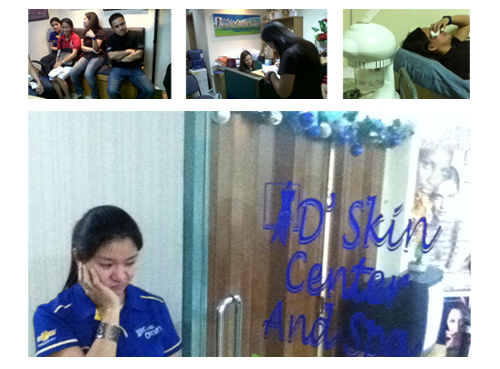 We are a group of 5, walked from Ayala to Makati Med area were the 'spa' is located. We're surprised to find out it was not a spa but simply a skin clinic. I didn't see or feel in any way that is a spa. The reception is crowded with chairs, a television set right in front of our faces, laughing and shouting (Showtime). The choice of TV program is entertaining (no offense, I'm a fan of comedy) but you can hear the audio all over the place. A spa is supposed to be a place for relaxation. The service we expected was a "Rejuvenating Facial Diamond Peel Treatment" as written on their ad. Seriously? Come on. Are they kidding? The service was poor and incomplete – It took not longer than 20 minutes from start to finish. First they will let you go in room, lay your back for some scrubbing cream on the face followed by a very quick steaming effect at only half of your face. A commanding voice will order you to transfer to another room for the quick diamond peel. It didn't feel right. Then we heard the employee say "Ilan pa ba yung nasa labas? Me mga sampu pa ba?" They seem to be in a rush. We thought we will be accommodated and treated like we paid P1,500 since the P250 price was a promo/discount price. Right now, they're offering the same service is offered at a different price scheme. We got ours for P250 instead of P1,500. Now it is P180 instead of P1,000. There’s definitely something wrong with this kind of marketing. I wonder what will you get with this one? Wash your own face with soap? I can get a much, much better one in Pinoy Spa inside Farmers Cubao for P250 (regular price). I am not promoting, just based on experience. I am sorry, but I am really disappointed with the service. I should have 2 good cold floats coffee and a good talk with a friend while seating on sofa in a good air-conditioned portion of Starbucks.